For millions of people around the world, plastic surgery is about more than simply enhancing one’s physical appearance. It’s a gateway to living a happier, healthier and more productive life – particularly for those living with congenital facial and dental conditions. Except corrective surgery isn’t always a feasible option, especially in developing or impoverished nations where a combination of low wages and poor healthcare infrastructure means quality medical treatment isn’t always accessible. As a result, far too many people have no choice but to live with severe congenital deformities that often have a major impact on their quality of life. The good news is that there are several fantastic charitable organizations dedicated to providing free cosmetic surgery to those who need it the most. Read on to learn more about how these charities are making a positive difference in the world and what you can do to support them. Many children are born in the United States with craniofacial conditions, which can have far reaching effects on their lives. Non-profit organization myFace, established in 1951, is committed to helping these children. “For over 65 years myFace has worked with these patients to provide comprehensive care by funding medical, surgical, dental, speech and psychosocial services, as well as research and public awareness (campaigns),” explains myFace Executive Director, Priscilla Ma. The people behind myFace are firm believers that everyone should have access to quality medical care. Home to a team of leading medical practitioners, cosmetic surgeons, and state of the art facilities, the myFace Center for Craniofacial Care, located at NYU Langone Health in New York City, supports thousands of procedures and consultations annually. The majority of those who receive treatment would not be able to afford medical treatment without myFace’s support. To this end myFace relies on the generosity of its supporters to provide high quality services and care. If you would like to make a donation, please visit the myFace website or call 212-263-6656. Smile Train is an international children’s charity that provides free cleft reconstructive surgery and care to children in over 85 countries around the world. The organization works closely with local doctors, providing them with the resources and expertise they need to provide cleft care in their own communities. Looking beyond the medical benefits, receiving this life-changing treatment can also have a dramatic effect on a patient’s financial situation. Based on Smile Train data, research published in the British Medical Journal Global Health found that receiving cleft lip and/or palate repair helped patients earn, on average, an additional $42,000 over the course of their lifetime, and contributed $20 billion to the global economy. There are many ways to support Smile Train, including donations, which can be made online, through the mail and over the phone, as well as a variety of corporate, school and community-driven fundraising initiatives. FACE TO FACE was established by the Educational and Research Foundation for the American Academy of Facial Plastic and Reconstructive Surgery (AAFPRS Foundation) in the early 90s to give their members a platform to provide facial repair surgery to those in need. FACE TO FACE – International: Provides surgical care to children born with facial anomalies in impoverished nations. FACE TO FACE – The National Domestic Violence Project: Helps survivors of domestic abuse receive reconstructive surgery to treat facial injuries. FACES OF HONOR: Provides free cosmetic surgery to soldiers who have been injured in the line of duty. You can support the AAFPRS foundation by going to their website and filling out the donation form. Contributions go toward supporting the cosmetic procedures involved with the aforementioned programs and the group’s general operations. Donations are also used to fund medical research and provide Lifelong Educational and Research Network members with ongoing specialist education. 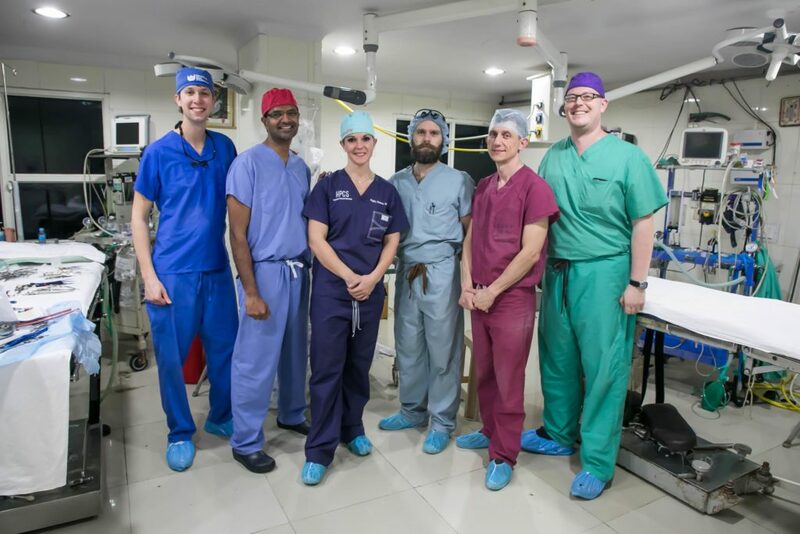 Above: FACE TO FACE International Facial Plastic Surgical team for recent mission trip to India (left to right): Jeffrey Cranford, Otolaryngology resident; Manoj Abraham; Regina Rodman; Scott Montgomery; Matthew Johnson; and Ryan Winters, all AAFPRS facial plastic surgeons. “Contributions will ensure that these critical programs continue to grow and expand, offering members the excellence in education and research that is unsurpassed in the specialty, while providing recipients of the humanitarian efforts an opportunity at a new life,” says Manoj T. Abraham, MD, FACE TO FACE Chair. Founded 25 years ago, Medical Missions for Children (MMFC) was born out of a desire to provide medical and dental care to young people born with congenital deformities in some of the most underserved parts of the world. Today, MMFC carries out 20 missions a year and has performed surgery on more than 30,000 children while providing dental care for over 50,000 children and young adults. The organization focuses its efforts on serving people who do not have access to high-quality healthcare due to financial circumstances or poor healthcare infrastructure. To donate or learn more about MMFC, you can visit the group’s website here. Orofacial clefts are among the most common types of birth defects and can affect a person’s ability to eat and speak. Millions of children in developing nations don’t have the financial means to access quality medical care and are forced to live with untreated clefts. That’s where Operation Smile comes in. Since its inception in 1982, the international medical charity has provided hundreds of thousands of reconstructive procedures for children and young adults in developing countries who were born with cleft lip, cleft palate, and other dental or facial conditions. Last year alone, the organization treated over 21,000 patients. Supported by a network of talented medical professionals and with a global reach covering more than 60 countries, Operation Smile is one of the biggest volunteer-based surgical care charities on the planet. By working closely with local hospitals, governments, doctors, plastic surgeons and health departments, the Operation Smile volunteer medical teams can provide high-quality care to those who would otherwise have to go untreated. Contributions go directly toward supporting Operation Smile achieve its objective of providing exceptional free surgical care to children and young adults born with facial and/or dental conditions. Check out the Operation Smile website for more information and to learn how you can help.